Novak Djokovic of Serbia hits a shot during his match against Jarkko Nieminen of Finland at the Wimbledon Tennis Championships in London on Wednesday. 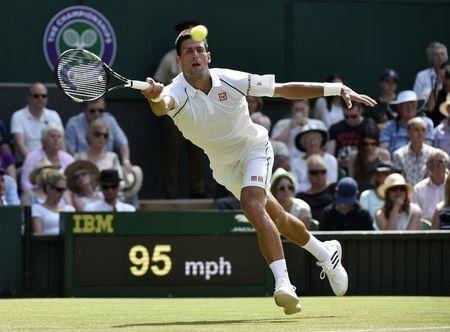 Defending champion Novak Djokovicreached the Wimbledon third round on Wednesday with a win over Jarkko Nieminen which brought down the curtain on the Finn's All England Club career. Top seed Djokovic, who won 6-4, 6-2, 6-3, will take on Australian 27th seed Bernard Tomic for a place in the last 16 as the Serb continues his bid to win a third Wimbledon and ninth Grand Slam crown. It was Djokovic's sixth career win in seven meetings against the 33-year-old Nieminen and the two men exchanged a warm embrace at the net once their 92-minute Centre Court duel had ended. "It was his last Wimbledon so I congratulated him on a great career," said Djokovic. "He's been around for many years and he's one of the nicest guys off the court and a great fighter on it. It was a pleasure to play him." Djokovic overcame a break early in the first set but from then on it was plain sailing for the champion who finished with an impressive 36 winners. "I was solid throughout. He broke early on but I regrouped and played some good tennis," added Djokovic. Nieminen, whose best performance at the All England Club was a quarter-final run in 2006, had ended the Wimbledon career of 2002 champion Lleyton Hewitt in the first round. After his own curtain call on Wednesday, he placed a kiss on the Centre Court grass as the fans gave him and the champion a standing ovation.